This workshop links Jung’s alchemical studies and his examination of the archetype of sacrifice to more recent research into the nature and dynamics of grandiose energies in the human psyche. In this program Robert Moore discusses how the decline of ritual containment of these energies in indigenous and traditional cultures has led to an epidemic of increased anxiety, addiction, and violent acting out. 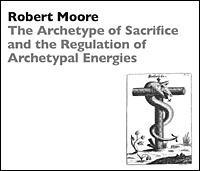 First, Moore introduces the role of the archetype of sacrifice and related techniques of ritual practice in human strategies of coping with the pressures of archetypal energies. Second, he links the failure of these traditional means to our current epidemic of narcissistic acting out. Third, he summarizes the ways in which recent research supports Jung and Edinger on the necessity of the achievement of an ego-Self axis—a conscious and willed sacrificial attitude in the individuation process. Finally, Moore outlines the clinical implications: the ways in which we must be much more specific in our understanding of the structure and dynamics of the ego-Self axis in relation to the analytical task. He discusses the implications of this understanding of sacrifice for our conceptualization of a truly Jungian understanding of a psychoanalytic “cure”—the task of optimizing the analysand’s conscious regulation of archetypal energies. In short, Dr. Moore argues that Jungian Analysis should return to its roots in a manner which draws upon the best in recent interdisciplinary research to build upon Jung’s foundational discoveries.